It's that time! Southgate Coins is in the camera's lens and Somer lays out the red carpet straight to your computer. Who knows maybe you can be famous too?? 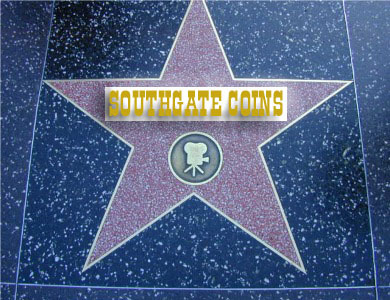 Last week, Southgate Coins was in the spotlight, filming our newest television spot for the holiday season. That’s right; the headline grabbing "CC" coins aren't the only famous folk around these parts. We girls now get our close-ups by Mr. Deville himself. Though many of you readers will not have the privilege of seeing these commercials, I just have to tell you that they will be a real holiday treat. Each girl with their own festive Christmas helper garb, and even a speaking role! With all this publicity, we have been reaching applicants left and right. So we designed a life-size cut out of Heather in the complete Southgate apparel, apron, polo, Red Book, and the pleasant grin we all possess. This cut out will be displayed at a Job Fair our company will be setting up at on the UNR campus. But that’s not the only thing that Heather's lovely face has appeared on this week. Rusty also designed a t-shirt with Heather as a cartoon character, wearing the Southgate uniform, flipping one of the coming soon Nevada statehood quarters. The quote "Flippin' Sweet," Rusty saw on another shirt representing Napoleon Dynamite, one of our favorite movie characters around here. Of course, the term "Flippin’" has different connotations depending who is using it, but here at Southgate, we use the term to describe how we attach our 2x2 cardboard flips that hold coins in our displays. Now I know what you are thinking, "but what about poor little Somer?" Don't worry I was not forgotten. I was given the task of developing a column because I love to write, obviously, and to help our customers better know what this company is all about. Rusty knew that I had an adoration for writing and after only a few months of working at Southgate Coins, he presented me with my very own platform to practice my art. Now after 40 columns, I have a body of work full of fond memories and much contentment. So there you go. It always starts with baby steps, and look at us all now!! This business has just flourished into a real operation. Can you imagine if a girl came to work here that had a serious passion for coins? Oh the possibilities Rusty would come up with!